I just read 2016’s recap and ugh. Emotional. I spent a lot of 2016 in a very dark place; by the end of the year, I was seeing things in a different light after a lot of self-reflection, but it’s still really painful to read. For 2017, I’m doing something different: I’m going to focus on the good parts of the year and do a highlights/best of. 2017 wasn’t all sunshine and roses by any means. A lot of the things I struggled with in 2016 carried into 2017, but I want to focus on the good parts. The things - and the people - who made me happy and made it a memorable year. So here we go! Every single day spent with my mum is a day I consider myself truly blessed. She’s not only an amazing mother, she’s the best friend a girl could ask for. We have so much fun living together, and even the most mundane task (like grocery shopping and hauling tons of bags home on the bus - blech) can turn into an adventure. Then there’s the Littles (my youngest niece and nephew, 4 and 7 respectively). They brought so much joy and laughter to our lives in 2017, as they’ve done since the day they were born. Those two tiny humans are so incredibly intelligent, creative, imaginative, hilarious, and sweet. I cherish every snuggle, every funny/sweet/ridiculously smart thing they say, and every memory we make together. I’m so lucky I get to spent so many days with them drawing and colouring, snuggling, playing games, watching movies, and going on adventures around our neighbourhood. In 2016’s recap, I wrote this: “Professionally, 2016 was a joke. All the crap going on in my life took up so much time and energy at the beginning of the year, I basically had to put my career on hold.” I wish I could say I spent 2017 writing my heart out, but there were still quite a few distractions, and my lack of motivation carried through the year. BUT...I did write a Christmas novella at the beginning of the year, which I published in November, and I finished writing the romantic comedy I started writing the year before. That feels like a huge accomplishment, especially considering I felt like such a failure after 2016. Mistletoe Kiss was the first new book I’d published in two whole years, and the response to it was better than I could have hoped for. I talked about how I was afraid people had forgotten me and I had become irrelevant in the publishing game, but the support I received was overwhelming (in the best way possible). I owe a lot of this to the bookstagram community, and a good chunk of my sales I owe to my childhood best friend, author Athena Wright, who mentioned the book in one of her newsletters, which prompted dozens of people to buy it. (*insert me crying like a baby*) I have a lot of writing plans for 2018, and I sincerely hope I get such an enthusiastic response for those projects as well! I didn’t make it too far from home this year, but I did take an amazing trip to Toronto with my friend Krista. 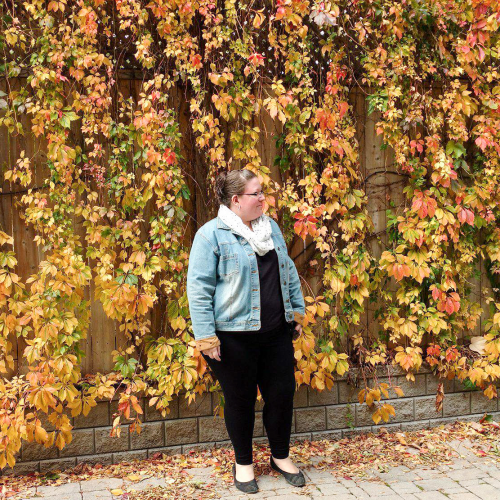 We got to explore Cabbagetown (a gorgeous part of Toronto I’d never seen before), and we shopped at the Eaton Centre and Curiosa (the second being somewhere I wanted to go from the moment I heard about it but figured I’d never actually get to go...also, I still have to write about our experience and what we bought there. I mean it's only been, like, two and a half months since we visited *facepalm*). The ultimate highlight of that trip: attending Jacquelyn Middleton’s launch party for her sophomore novel London, Can You Wait? Held at the Wickson Social, Jackie’s party exceeded all my expectations. Amazing food and drink, fun people, and meeting Jackie in personal after a year of being friends online was one of the high points of 2017. Plus it was great to spend two whole days with Krista since we didn’t get to see each other much last year. 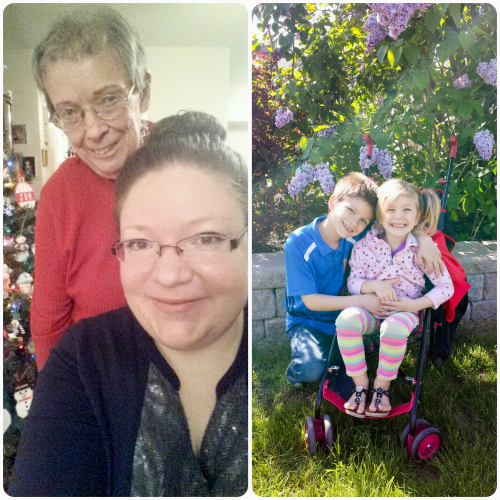 ☆I spent some super fun days with my friend JaimeKristal while she was home between travels. She arrived back in town in November 2016 after 2 years of living in London, and left again in August 2017, this time for 2 years in Ireland. In the months we had together, we went to a Harry Potter event at Chapters, saw a local production of Pride and Prejudice, had a fancy tea party, watched the Canada Day fireworks by the bay, and spent hours chatting, watching movies, and shopping (mostly for books and Funko Pops, naturally). I enjoyed my time with her so much and was sad to see her go, especially since I’d initially hoped to go with her. It puts a lump in my throat just thinking about it, so I won’t get into it again, but I talked all about it in a post called Pity Party: Table of One. This wasn’t an easy post to write, but the response I got to it made me feel so much better, and the embarrassment and shame I felt over potentially coming across as a whiner was completely washed away by the support I got. ☆I saw my college best friend Missy for the first time in almost ten years. We spent the day with our mums and her three kids at the park. It was an unexpectedly emotional experience seeing her again after so long, and we unpacked a lot of baggage and reminisced about our college days, plus caught up on a lot of current news. ☆I read a lot of great books in 2017. Added several new favourite books to my shelves, and discovered new authors. I hit my GoodReads goal of 85 books read in 2017 (completed this goal 2 hours before midnight on the 31st!). If you’re looking for some recommendations to kick off 2018, I shared my 17 favourite books of 2017 as my last post of the year. ☆Bookstagram continued to be a great source of pleasure for me. I’ve made so many friends in that community, and I love that I get to share my passion for books there, and that I can be my nerdy self. It’s also been an absolute joy to continue being a rep for NerdyGrlDesigns (who’s in the process of moving from an Etsy shop to a standalone webite, which is why I linked her Instagram rather than the shop; you can keep an eye out there for updates) and seeing Melisa branch out and turn her business into a thriving one, plus she created a Society6 shop with her designs. I also co-hosted my first ever photo challenge in December with my wonderful friend Caryn, which exceeded all my hopes and expectations. We had so much fun, we’re hosting another challenge for January. I also had a lot of fun with my personal/author/blog Instagram in 2017. I posted there more consistently and created more of a focus for my feed. I did most of this with the help of Helene Sula’s blog, Instagram, and her course Instagram for Success. Her tips and advice helped me more than double my following on my personal account, and I’m continuing to grow and learn and improve slowly but surely, as well as apply those things to my bookstagram account. Let me just say, one thing that was a massive game changer for me: Lightroom. ☆I changed the direction of this blog from a book blog to a more general blog...but still with an emphasis on books! I know some people say having a niche is important and there are all these things you ‘should and shouldn’t do’ on your blog, but you know what? Screw that. I want to talk about what I want to talk about. I want to help other writers (especially those who choose to self-publish like me), I want to gush about books, I want to talk about travel and photography and life, so that’s exactly what I’m going to do. I basically just want to be my nerdy, quirky self, and hope I find other nerdy, quirky people who will appreciate what I have to say. So, that’s my 2017 in a nutshell - the good parts, at least. It was a year of ups and downs, as most years are, but it was certainly better than 2016! I have a lot planned for 2018, which I’ll talk about in an upcoming post. Watch for that soon! What were some of the highlights for you in 2017? Did you travel? Read some great books? Start a new hobby? Have great things happen in your personal life? I’d love to know! 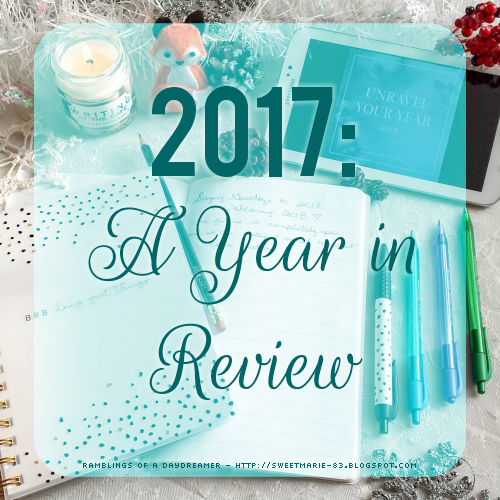 Tell me in the comments below, and if you posted a yearly recap, feel free to leave a link so I can check it out. Wishing you a wonderful 2018 full of laughter, light, hope, and love. I’m glad 2017 was better than 2016. And I’m happy to see you focusing on the good things. Life always will have downs but if I focus on the ups it makes all the difference. Thank you, Jenny! It definitely makes a difference to focus on the good things. Sometimes my brain gets stuck in negative mode (usually thanks depression and anxiety) but I've been working hard to break out of those habits. I hope you have a great 2018! I'm happy to hear about your new novella and all the great times you were able to share with your friends! I hope 2018 is even better for you!